Royal College of Art graduate Thomas Thwaites has built a working toaster from scratch, extracting raw materials and processing them himself in an attempt to replicate a mass-produced toaster he bought in a shop for less than £5.00. Thwaites, a student on the RCA's Design Interactions course, used the project to explore how cheap, everyday items are dependent on sophisticated global supply chains that are invisible to consumers. The Toaster Project is on show at the RCA Show 2009, which opened this week. At the show, Thwaites presents his toaster and some of the home-made implements he created to process and mould raw materials (above). Above: a suitcase of iron ore from Wales. Above: smelting iron ore in a microwave oven. Above: smelting iron ore in a leaf-blower furnace. Above: the toaster Thwaites tried to replicate - an Argos Value Range two-slice model. A design student at the Royal College of Art in London has made a toaster – literally from the ground up. Thomas Thwaites has travelled to mines across the country to get the raw materials for his toaster. Processing these raw materials at home (for example he smelted iron ore in a microwave), he has produced a 'kind of half-baked, handmade pastiche' of a toaster you can buy in Argos for less than five pounds. Thwaites’ toaster has cost £1187.54 and has taken him on a 9 month quest around Great Britain. “The steel parts in a shop bought toaster probably came from rock mined in Australia. Now they're on my kitchen worktop – for the price of less than an hour’s work. Quite amazing,” says Thwaites. “The real cost of objects is hidden. You wouldn't want iron smelted or plastics being melted in your back garden, trust me. Though my neighbours have been quite nice about it,” he continues. However, the practicalities of the project came as quite a shock when he realised that he'd need to find and process nearly 100 materials to make a true likeness of the Argos Value Range toaster he used as his model. Thwaites’ toaster uses just five materials; iron (for the grill), copper (for the pins of the plug and the wires), plastic (for the casing, plug and wire insulation), nickel (for the heating elements) and mica (around which the heating element is wound). Steve Furlonger, the former Head of Sculpture at Central Saint Martins College of Art and Design, and Director of Windsor Workshops, described Thwaites’ project as “disguised information”, adding, “Under his toaster making project he is saying profound things, of a different order. The 'failures' he encounters, during his toaster making, point to the success of his real message; that we have become disconnected from how our world is supported and sustained." 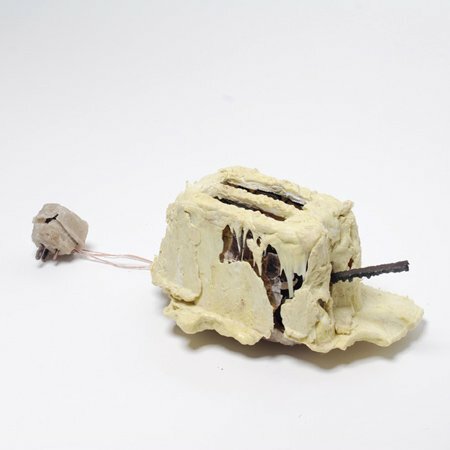 Thwaites completed the project as part of his MA in Design Interactions from the RCA and will be displaying his toaster (and making toast with it) at the RCA Show Two, the College’s annual graduate showcase for new designers from 26 June. He is also working on a short film and book which documents the toaster project in full.